What if you could collect customer feedback in one place to finally figure out what they love and loathe? You’d probably have happier customers. 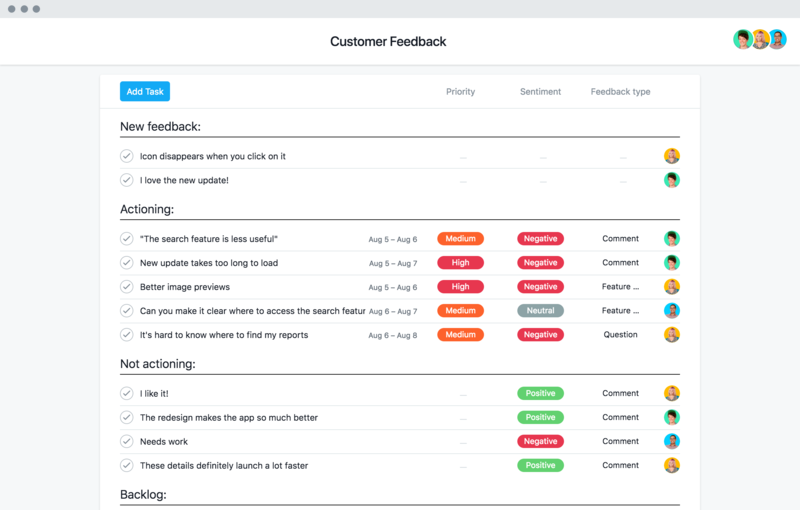 Get started with this customer feedback template. Listening to feedback is one of the most valuable ways you can connect with your customers. But when it comes in across different channels, it can be hard to make sense of it all. Collect the same details every time. Trying to understand feedback trends and themes is difficult if you don’t have the same information for every piece of feedback. Use custom fields or a form to ensure you’re tracking the same information on each piece of feedback. Connect tools to send feedback to one place. Whether your customer sends an email or fills out a form, make sure you can connect it to your project management tool, like Asana, so it all lands in the same place. Quickly turn ideas into action. Your customers are always spotting bugs and coming up with helpful ideas, so why not turn them into action? Turn feedback into assigned tasks for your team to tackle. Show “must-do’s” vs. “to-do’s.” While it’s important to acknowledge all feedback, product teams need to prioritize which feedback will make it on the roadmap. Use custom fields to show feedback priority. Without the right processes and tools in place, implementing feedback can fall to the wayside. Prevent it with these tips. See how the team at StyleHaul collects, prioritizes, and implements customer feedback. How does using Asana for feedback help you iterate faster and deliver a better product? Take our course and find out.